Mantra by Bibiji Inderjit Kaur, wife of Yogi Bhajan, is a guide to the special code of the "Yoga of Sound" – a code to merge your mind with the infinite creative fire of life. When reciting mantra, you project the vibratory frequency of your own molecules into the infinity of the Cosmos. 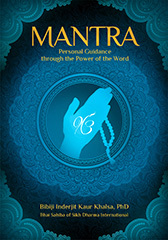 In this beautifully-produced and comprehensive book you will find hundreds of mantras to recite and repeat, to elevate and modify your consciousness, and to help with the personal daily needs you face in your life.